Melin Meirion Mill Shop at Meirion Mill Woollen Centre01650 531311work Craft CentreThree bridges cross the River Dyfi at the entrance to Meirion Mill in the Dyfi valley on the southern border of the Snowdonia National Park. The hardy Welsh Mountain sheep can be seen dotted on the steep mountain sides and sheep and their wool have always been important to the local economy. This connection is reflected in our exceptional range of woollen goods from traditionally woven throws and tapestry bedcovers in exclusive colourways to cosy sheepskin slippers. For the creative crafter we stock knitting wool, fabrics, buttons and ribbons. We have various sizes of peg looms which are made in Powys, and have one available for demonstration. For rambles in the countryside we offer waterproofs and outdoor clothing for all the family with ranges from Regatta and Champion, Sherwood Forest and Lazy Jacks. We also have casual styles from Lily and Me and colourful knitwear for every season. Our jewellery ranges include Carrie Elspeth, Ronin, and Vanilla, all made in Wales and Celtic designs from Sea Gems. We offer a wide-ranging selection of handbags and accessories, welsh crafts and lots of gift ideas for the home and garden. 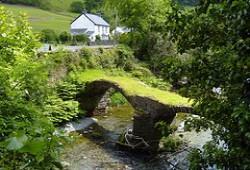 At the entrance gate, Pont Minllyn, an early 17th Century Double Arch Packhorse Bridge spans the river Dyfi, built by Dr John Davies the rector of Mallwyd 1604 – 44. Three bridges cross the River Dyfi at the entrance to Meirion Mill in the Dyfi valley on the southern border of the Snowdonia National Park. The hardy Welsh Mountain sheep can be seen dotted on the steep mountain sides and sheep and their wool have always been important to the local economy. This connection is reflected in our exceptional range of woollen goods from traditionally woven throws and tapestry bedcovers in exclusive colourways to cosy sheepskin slippers. The Coffee Shop takes last orders 30 minutes before the shop closes. Access to the Meirion Mill site is directly off the A470 , midway between Machynlleth and Dolgellau, and is a short distance from the junction with the A458, the main route into Mid Wales from the West Midlands via Shrewsbury and Welshpool.